Portadown miss out on going five points clear at the top of the Premiership as they are beaten 2-1 by bottom club Warrenpoint at Milltown. 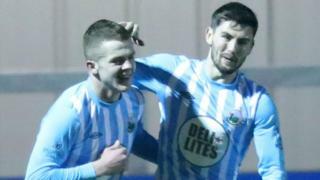 Ciaran O'Connor's goals put Warrenpoint 2-0 ahead at the break and, while Gary Breen pulled a goal back, the home side held on to win. Linfield and Cliftonville will both move ahead of the Ports if they win their games on Saturday.